Thermal transfer printing is one of the most widely used print technologies for dedicated barcode systems. Ideal for a variety of applications, thermal transfer printers use a heated print head and a thin ribbon to create high-quality, long-lasting barcode labels. 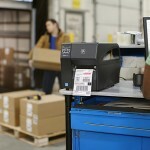 The Zebra ZT220 mid-range thermal transfer printers are ideal for warehouse management, inventory control,and shipping. Barcode ribbons have a wax, resin, or a wax/resin coating on one side. When a thermal transfer label or tag passes through a thermal transfer barcode printer, heat from the print head melts the wax or resin. This process transfers ink to the label. The result is crisp, high-definition images of the highest quality. If you are printing items with a shorter shelf life such as shipping labels or event tickets, you may be interested in a direct thermal printer. Compare both thermal print technologies to see which one is right for you.